Sky is a smartphone adventure for up to 8 players that "touches people's hearts"
Sky, the next game from Thatgamecompany, is everything you’d expect from a mobile game by the creators of Journey, and a bold step beyond. 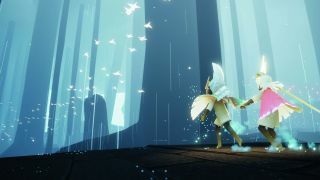 Conceived by Jenova Chen in part thanks to emails he’d receive from fans wishing they could play Journey in multiplayer with friends and family, rather than unnamed strangers, it’s an eight-player, freeform adventure set across six sprawling islands. It’s quite the thing, which is why it graces the cover of the new issue of Edge magazine, which lands with subscribers from today. In this exclusive excerpt, Chen explains the core philosophy behind Sky’s appropriately lofty aim: to do what Journey did but for more people at once, in a way that appeals to players of all kinds and skill levels. Do you see Sky as a spiritual successor to Journey? I wanted to combine all the games that we’ve made, and the lessons we’ve learned, going back to Cloud, which I made in school on a PC – [like Sky] that game is about flying in the clouds. So I wanted to make a new game that had all the good parts of the others. Originally, Sky was actually supposed to be Cloud’s sequel. But then as we made it, we realised there were so many things from Flower, Flow and Journey that we wanted to influence it. And so as a result, it’s more like a spiritual sequel of Flower, Journey and Cloud. "For quite a while, most of the friends I grew up with stopped playing games. They told me, ‘Games are for kids’. Or ‘I’m just too busy"
Did you learn a lot from Journey in terms of encouraging players to collaborate with one another? Oh, yeah. But it’s really about how you set up. I mean, if you go to the community of any competitive game, when players actually get to talk to each other on forums or in the game the conversation is inevitably going to be competitive and demanding, basically, and that shows one side of human dynamics. If you want people to connect with each other at an emotional level, a power fantasy doesn’t help. Like, if this guy is Superman and this guy is Batman, then it’s logical that the first thing they think about is who is the more powerful. People only think about collaboration, communication, and making connections when they don’t feel they are on top of the world. If you ever go hiking, when you run into someone on the trail, it’s usually very friendly, and you help each other out if necessary. But if you’re in the middle of Times Square or London, where people are busy and their mind is filled with their agenda of executing power or gaining more power – everybody’s levelling up, right? – when you try to talk to somebody or connect with someone, they don’t have time to pay attention to you. You have a particularly strong desire to bring games to new players, don’t you? For quite a while, most of the friends I grew up with stopped playing games. They told me, ‘Games are for kids’. Or ‘I’m just too busy. I don’t have time to play 40-hour-long games’. So they left games behind. And personally I felt really sad that the thing I loved was no longer meaningful to the people I cared about. So my goal is always about making games relevant in that way. Certainly my parents would never consider games as something for them. I’m doing everything I can in my career so that when I retire and tell people I’m a game creator, they would see me as if I told them I was a poet or a screenwriter or a novelist. There’s an innate sense of respect when you tell them that you’re an artist, you create something that talks about and deals with humanity. Right now, if I tell people I’m a game creator, they usually either think, ‘Oh yeah, my kids play games, they probably play too much’ or they’ll say, ‘Oh I heard about this game that made a lot of money, did you guys get rich?’ For me, there’s only one way to change the situation. Well, people still say, ‘Are you a gamer?’ They don’t say, ‘Are you a music listener?’ or ‘Are you a TV watcher?’ It’s more, ‘What kind of mood are you in? Let’s go watch a movie,’, right? Like, whatever type of emotion you need to experience, there’s a movie or a piece of music for that particular need. The fact people are asking you ‘Are you a gamer?’ assumes that there are certain emotions that gamers would prefer as entertainment, and that most of the other emotions that society needs, games don’t provide. So my goal is to push the boundary of the emotional range and depth that games provide. And for me, the most effective way is to allow a gamer to play with their family. A lot of times, a gamer will enjoy a ‘gamer game’ a lot, but it’s too much for the people around them that don’t play games. Like my favourite game is Dark Souls, or maybe Shadow Of The Colossus – these are very difficult games! I could not imagine my wife being able to play these games and say she enjoys it. And so, I was hoping to create a game that gamers love, but that they also feel comfortable to invite their partner, their kids, maybe even their parents to play together. Edge 331 goes on sale Thursday, March 28, though subscribers begin receiving their issues today. To join them, check out our latest Edge magazine subscription offers.